Earlier, I had written a post on managing dry waste. I got a lot of positive feedback and encouragement (thank you all!) for that post. Continuing on similar lines, let me talk about five ways by which I manage wet waste at home. Wet waste refers to waste generated from cooking, take-away food, left-overs etc. Segregating dry waste and wet waste is a mandatory rule in Bangalore. In-house composting of wet waste in apartment complexes is also being enforced in order to control the amount of waste that gets into landfills. 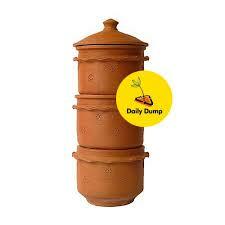 Since 2010, my husband and I have been diligently using Daily Dump's Khamba to compost wet waste, mainly the fruits and vegetable peels. It has become a habit for us to dump such waste directly into the compost bin 2-3 times a day. The Khamba sits in a corner of our balcony and doesn't emit any smell. It doesn't attract any rats either. Maggots do come into the bin but they only fasten the composting process. Our 5 year old daughter gets excited to see the maggots whenever my husband mixes the bin. He typically takes the filled bin once a week, adds dry leaves fallen on the floor from our little garden and mixes them together with a pair of garden tongs. We get good quality compost that resembles mud once every 3-4 months. Home compost rightly deserves the name "black gold". We sprinkle this compost onto our plants. Through this home-based composting, there are hardly any fruits and veggie peels that get added to our wet waste bin. I plan my meals in advance, according to the veggies I have brought from store. I had earlier written a blogpost about how to put veggies to good use without letting them rot in your fridge. I follow this simple practice that has helped me tremendously in controlling the veggies that go unused. Do check it out. The only other wet waste that goes out of our home in little quantity is cooked food. With more than 10 years of cooking experience, I know exactly how much to cook for my family. I always prefer to cook the exact required quantity (sometimes even less) rather than cook more and store left-overs (or throw away the excess food). We prefer to eat fresh home-made food and I cook 2-3 meals a day. But there is hardly any food that gets wasted. I'm strict with my daughter about food wastage. I would rather serve little on her plate and let her finish it fully than add more food to her plate that she would find it hard to finish. I know her food preferences and I don't experiment with her school lunch box. Tried and tested food items feature repeatedly and the dabba comes home empty most of the time. Coming to take-away or store-bought food, we don't order food from restaurants or from the food delivery startups. Even when I'm tired or not well, we would rather eat a simple curd rice or dosa with chutney podi at home. We go to restaurants once a week but don't carry home any left-overs. This may not work out for everyone but my only suggestion is to order the required quantity and avoid food getting wasted. We follow these principles 90% of the time but there is still 10% to be improved. Hopefully one day, we'll hit the 100% mark and I don't keep my wet-waste bin outside my apartment for collection ever. Do share if there are other ideas of managing wet waste at home.